This common block is for convenient removable screw terminal plug commoning of power and ground connections. The common block uses standard spacing that matches most other Mesa daughter cards. 24 terminals are provided with each common blocksplit into 2 groups of 12 commoned pins. 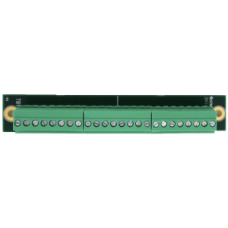 3.5 mm pluggable screw terminal block are used for all connections.